Large numbers of this, surely one of the most charismatic of our wildflowers, now only occur in a few localised colonies in damp water meadows in the south of England. Occurences in the countryside elsewhere are likely to be escapes from gardens. The first record of this plant was made by a botanist, John Blackstone, in 1736. He was recording the plant's presence in a meadow near Harefield in Middlesex, but it is absolutely certain that this flower was recorded much earlier from many places in England where it flowered by the thousand in water meadows close to villages. 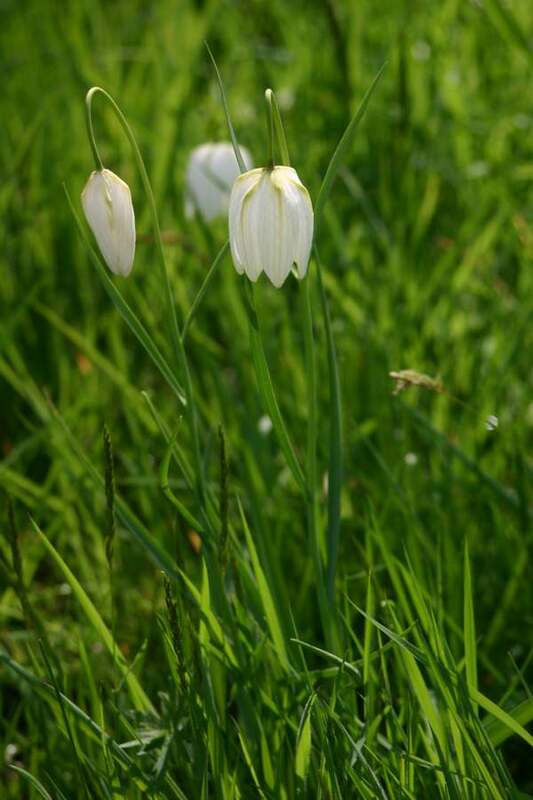 The many local common names for this beautiful lily are testament to its long history - Crow Bells, Leper's Lily, and Sulky Ladies to name but a few. Today this plant is in serious retreat because of the destruction of its habitat for agricultural purposes. The best-known site in England now is Magdalen College Meadow in Oxford which is covered with flowers in April each year. 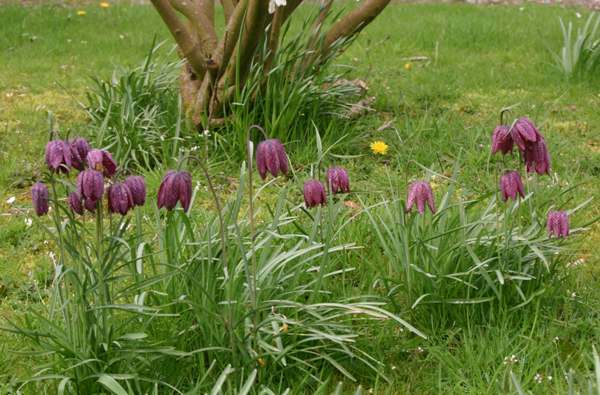 Many attempts have been made to restore the plant to some of its former sites, but the success of these enterprises (mainly utilising bulbs obtained from nurseries) is mixed. The flowers are either a greenish-cream in colour or a deep, dusky purple. The outside of the petals have a chequered marking appearing almost like scales which is more noticeable in the purple flowers than the cream ones where the pattern is often hardly discernible. The slender plant grows up to 30 cm in height and the nodding flowers are large - 5 cm in length. 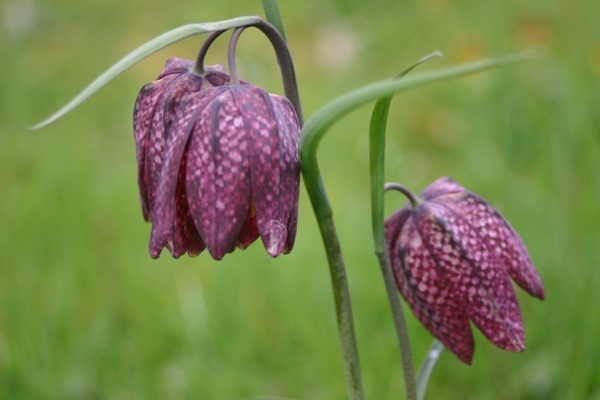 Most botanists believe that this fritillary is a post-glacial native of Britain, but for most of us, the most convenient place to see this wonderful wildflower is in a botanic garden which is where the photographs on this page were taken. Some of the more famous sites in the southern England have 'open days' and arrange special car parking in adjacent fields so that the flowers can be seen in their natural habitat. The plant is found in many European countries, including Slovenia.